When my sister and I were little, our uncles brought us to Princes Street gardens and bought us an ice cream each. Like every cartoon of an ice cream, it was a tall Mr Whippy with a crumbly flake poking out of the side. Yet the game changer was the raspberry sauce, pooling into the crevices of the slowly melting swirls of ice cream. I had never tasted something so delightful before, bubblegum pink and distinctly jammy. The raspberries I knew were fat and sweet and picked with our Granny in summer, but the sauce that made my fingers sticky that day was different. Sugary sweet, as though a raspberry had been transformed into candy, I knew I never wanted another ice cream without it. Forevermore, cones with a healthy dribble of raspberry sauce have brought me back to that first taste in Edinburgh by the carousel. As the years have passed, so have my ice cream tastes. I was a mint choc chip girl for most of my childhood until I tried cookies and cream in Australia. I had my first ice cream sandwich in San Francisco, picked from a supermarket freezer and enjoyed it dreamily as trams passed us by on the streets. In Aberdeen we lived near a Baskin and Robbins and a late night sundae piled with birthday cake, hokey pokey and pistachio almond was the ultimate Saturday night treat. Yet the combination of soft vanilla and sweet raspberry have always been the perfect way to round off a sunny day as soon as I hear that tinny nursery rhyme music. 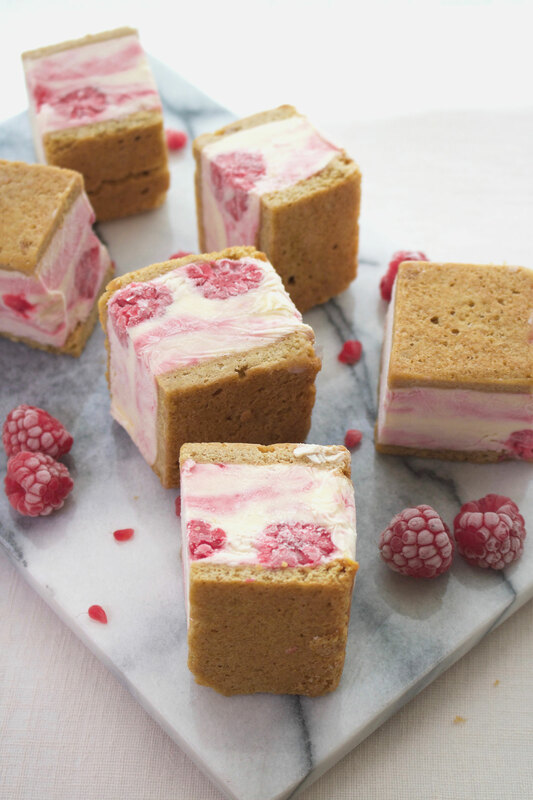 To recreate the childhood magic of that ice cream cone with raspberry sauce, I turned to my teenage favourite of cookie sandwiches for a slight twist on a classic raspberry ripple. 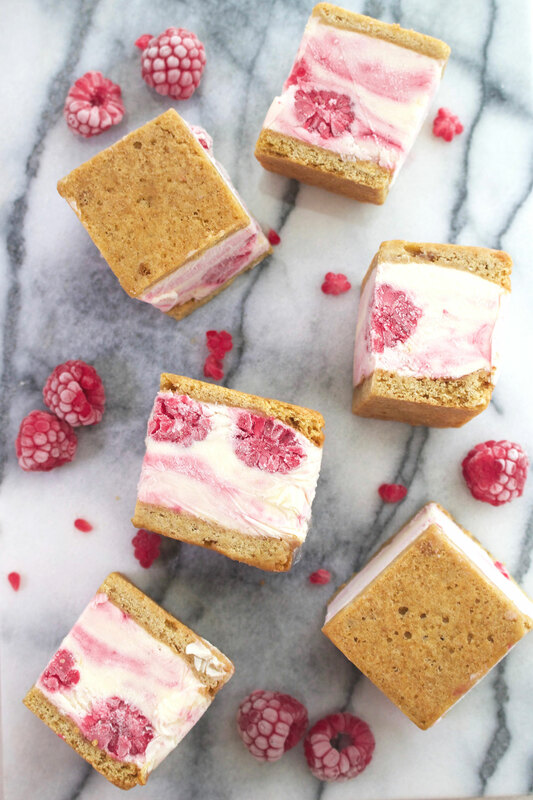 A tower of sweetness that can be held with both hands, these ice cream sandwiches are layered with soft cookie, a quick no-churn ice cream and marbled with my take on the classic pink sauce. Working with Scotty Brand, who champion the best of in-season Scottish produce, I picked up their plump raspberries grown in Perthshire and transformed them into a jammy raspberry coulis with notes of vanilla. 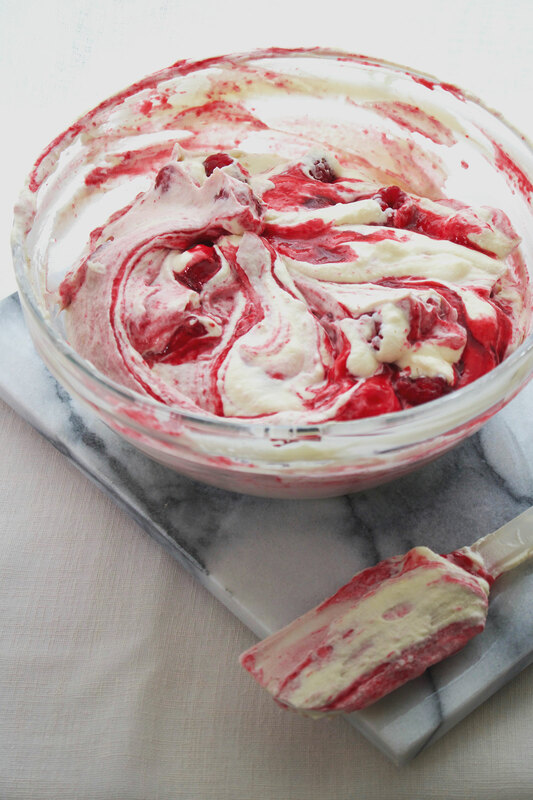 Fat whole raspberries offer an icy bite of sweetness alongside crumbling cookie layers to hold onto, rippled ice cream melting slowly down your arm. They may be a slightly grown up version of the ice cream I first had by the carousel, but each bite reminds me of the sweetness of childhood. This is a sponsored post in collaboration with Scotty Brand, but all opinions are my own. You can pick up Scotty Brand berries in ASDA and Morrisons. To make the raspberry ripple coulis, place the raspberries, sugar, water and vanilla paste in a saucepan and place over a medium heat. Bring to a gentle simmer, then stirring gently, cook down the coulis until thick for around 10 to 12 minutes. Remove from the heat then sieve the coulis over a bowl to remove the seeds. Once cooled to room temperature, cover with clingfilm and chill until needed. To make the cookie layers, preheat the oven to 190oc/170oc fan and grease and line a 20cm square tin with baking parchment. In a bowl, beat together the butter and sugar using a handheld mixer for around three minutes until pale and creamy. Add the egg and vanilla paste then beat again. 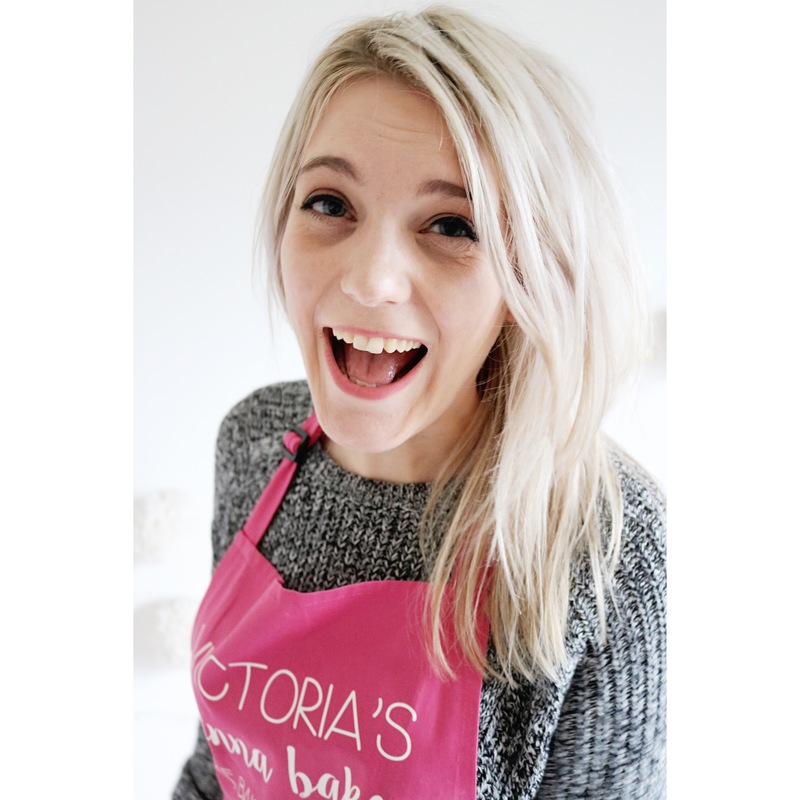 Mix together the flour, baking powder, bicarbonate of soda and salt together in a separate bowl then add half to the buttery mixture. Beat the cookie dough until smooth then add the remaining dry ingredients and beat well. Divide the dough into two portions weighing roughly 200g each then spread one in an even layer at the bottom of the tin. Bake for 10 to 12 minutes until golden brown then remove from the oven and cool in the tin. Flip the tin over onto a wire rack and carefully ease the cookie layer out using the baking paper. Grease and line the tin again and repeat with the second batch of cookie dough. Leave both layers to cool completely. To make the ice cream, whip the double cream to stiff peaks in a large bowl. In a separate bowl, whisk together the condensed milk and lemon zest then add a large dollop of the whipped cream and fold together. Add the condensed milk mixture to the whipped cream and carefully fold together until smooth. Add the chilled coulis and the raspberries then carefully fold the mixture a little to marble it. To assemble, line a 20cm square tin with baking parchment then carefully place one cookie layer at the bottom, right side up. Dollop the ice cream mixture on top, taking care not to blend the colours too much and smooth until level. Add the last cookie layer, right side down and pressing lightly, then wrap the tin with clingfilm. Place in the freezer to set for at least 6 hours. Once set, remove the tin from the freezer and leave to thaw slightly for around ten minutes. Lift the ice cream sandwich out of the tin then carefully cut into 12 squares using a sharp knife and serve. Alternatively, wrap each individual sandwich in clingfilm and store in the freezer for up to two months. This looks so crazy yummy! Lovely post! Thanks very much hope you enjoy them! If I show this to my kids….. I am sure they will love it. I hope so Wendy, who doesn’t love an ice cream sandwich?! I think my eyes just popped out their sockets ha ha. These look amazingly yummy! I’ll definitely be trying this recipe!